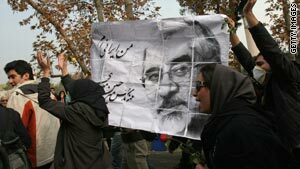 Iranian opposition supporters hold a picture of Mir Hossein Mousavi during an anti-government demonstration. Tehran, Iran (CNN) -- Iranian seminary students and teachers, angered by anti-government protests earlier in the week, held their own demonstration Saturday to show support for the founder of the Islamic Republic, the semi-official Fars news agency reported. The backers of former leader Ayatollah Khomeini gathered at the Marvi seminary, a center for religious conservatives, in the Naser Khosro district near Tehran's central bazaar, Fars said. The seminarians and faculty, led by one member each of parliament and the Council of Experts, chanted slogans extolling Iran's leaders, including Supreme Leader Ayatollah Ali Khamenei. There also was a protest in the city of Zanjan in northwest Iran in which demonstrators shouted, "Death to Israel" and "Death to the United States," according to Fars. The news agency said the walls of Tehran University were draped in black to protest against supporters of Mir Hossein Moussavi, the unsuccessful candidate in the June 12 presidential election. Fars reported that Moussavi's supporters insulted Khomeini in Monday's demonstrations, in which tens of thousands of Iranian students participated. The news agency said the previous demonstrators, who clashed with police, tore posters with Khomeini's image. Crowds at Tehran University also chanted "Death to the dictator," witnesses said, apparently referring to Iranian President Mahmoud Ahmadinejad. Meanwhile, pro-government crowds at the college chanted slogans and waved the flag of the Islamic Republic, according to witnesses. The protests Monday took place on Student Day, an annual observance extolling the virtues of the Islamic Revolution, which toppled the Western-backed Mohammad Reza Pahlavi, the shah of Iran. The holiday remembers the killing in 1953 of three university students by the shah's security forces. International media were barred from covering the protests, which were acknowledged by state-operated Press TV. Students this year have been demonstrating against the disputed presidential election in which Ahmadinejad was declared the overwhelming winner in what protesters say was a rigged election. Fars reported Saturday that anti-government protesters "insulted" Khomeini. "Foreign TV networks, especially those belonging to the U.S. and Israel, have gleefully shown the film of (people) tearing the photos of the late Imam Khomeini which was staged by their reporters. They have shown this video several times. For example, the Al-Arabiya network that belongs to Saudi Arabia keeps broadcasting the video every few hours." The head of parliament's Judicial Commission, Hojatoleslam Ali Ghobadi Shahrokhi, told Fars, "The most sacred thing for us is the name of Imam Khomeini. Those people (protesters) have no longer any credibility with the people who know that they are showing a green light to the arrogant powers. "The Judiciary will definitely severely confront those people who caused such incidents," such as tearing the posters, Fars quoted him as saying. Shahrokhi told the news agency that merchants at the bazaar condemned those who insulted Khomeini and plan to stage a protest Monday night. "The Society of Islamic Associations of the Bazaar today issued a statement condemning anti-government protesters who insulted Imam Khomeini in the December 7 Student Day demonstrations."